Japanese Kanji Symbols about Revolutionary Army in ONE PIECE. I wrote “Kakumei-Gun”. It’s Japanese kanji symbols for Revolutionary Army. 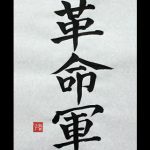 “Kaku” means To berenewed “Mei” means God’s will “Gun” means Army “Kakumei” means Revolution. Monkey D. Dragon (Luffy’s father) is the leader of Revolutionary Army. What is your favorite word in “ONE PIECE”? I’m waiting for a request.